"We do onstage the things that are supposed to happen off. Which is a kind of integrity, if you look on every exit as being an entrance somewhere else." Named a "Good Odd" and a Top Choice for Affordable Theater by Time Out NY! With Alex Alcheh*, Alan Altschuler*, David Arthur Bachrach*, Kristen Carbone, Erin Cronican*, Janice Hall*, Robert King*, Philip Lakin*, Oliver Lehne, Max Lorn-Krause, Brandon Walker* and Jason Wilson. Hailed as The Best Play in the English Language, HAMLET is the quintessential Revenger's Tragedy of an unlikely hero, unearthing the story behind his father's sudden death. Stoppard's classic (and hilarious) treatise on existentialism, ROSENCRANTZ AND GUILDENSTERN ARE DEAD, is a worm's-eye view of the tale of Hamlet from Shakespeare's own Beavis and Butthead. Which version is reality? Which one is a dream? With 1 united cast of 12 actors taking the same roles in both plays, come experience both sides of this classic story in the daring ensemble-driven manner that's made The Seeing Place a fixture in the NY indie theater scene. Click to Download "Fun Facts: The History of HAMLET & R&G"
June 6, 2013 (HAMLET) - Topic: What is "Actor-Driven" Work? June 19, 2013 (R&G) - Topic: Building a Spin-Off: How We Crafted R&G via our production of HAMLET. Chris McKittrick, Daily Actor - "I know what you’re thinking — I’ve seen Hamlet before. But if the world made more sense, [those] who are studying Shakespeare would show up at the Sargent Theatre to experience Shakespeare with this engrossing production of Hamlet from The Seeing Place instead of experiencing his work through Sparknotes (or worse, Wikipedia)...The Seeing Place is doing Hamlet in repertory with Tom Stoppard’s Rosencrantz and Guildenstern are Dead, and the cast plays the same roles in both productions...The material is inherently absurd, particularly when the principal cast members in Hamlet show up and portray their characters (in the words of Christopher Guest’s Nigel Tufnel) turned up to eleven...Hamlet is the can’t-miss of the two, but at the very least you should see Hamlet first and then, if you like what TSP is doing (and you probably will), come back to see Rosencrantz and Guildenstern are Dead bumble across the stage... it’s a wonderful way to get to know Shakespeare’s characters in new ways." Carey Purcell, CareyPurcell.com/Playbill - "This ensemble of actors is clearly comfortable with the material; they converse with ease and give natural performances that are, if anything, understated...The staging is also very clever, peppered with strategically placed moments of comedy...this skillfully and naturalistally performed production by The Seeing Place provided a thoroughly entertaining look at Shakespeare’s work in a new way." Howard Miller, Upstage Downstage - "Gutsy Productions by The Seeing Place: Voyeurism, simplified. That is the motto of The Seeing Place, one of those amazing up-and-coming shoestring-budget theater companies that manage to pull off compelling and gutsy productions of challenging plays in various pockets of the city...The production is dominated, as it should be, by the title character, here played with Ethan Hawke-like gusto by The Seeing Place’s founding artistic director Brandon Walker. Mr. Walker brings out all of Hamlet’s neurotic indecision and pretty much erases the distinction between the character’s feigned madness and actual madness. He is a charismatic and compelling actor, who brings to fruition the company’s motto (voyeurism, simplified) and draws the audience into his world. " Mark Savitt, Hi Drama! - "The Seeing Place Theater is presenting in rotating rep with the same casts both Shakespeare's Hamlet and Tom Stoppard's Rosencrantz and Guildenstern Are Dead. What a great (and difficult) idea! Eva Heinemann and I got to see the rarer of the two shows R&G, in which minor characters from the Shakespeare play take center stage. Hamlet's college friends the philosophical Guildenstern (Robert King) and the frat boy Rosencrantz (Philip Lakin) spend a lot of time hanging out at the palace waiting for Hamlet (Brandon Walker) and chatting with the players (David Arthur Bachrach, Kristen Carbone, and Oliver Lehne). The new king Claudius (Jason Wilson) and Hamlet's mother Gertrude (Janice Hall) enlist the lads' help to spy on their disturbed prince. It's a deliciously skewed view of a familiar classic, done by an ambitious young troupe. The play is rich in irony and existential melancholy as we know the main characters inevitable conclusion. It's how they reach that situation that is so intellectually entertaining. They are a very promising company." Jennifer Lau, Close Encounters of a Theatrical Kind - "This production boasted a cast that played their parts with much subtlety, which was a refreshing change from the sometimes over-heightened range of emotions displayed in many of the film adaptations I have seen. Kudos to this cast of twelve (some doubling up on the minor roles) for their brilliant delivery of speeches and lines that have been recited by countless actors in the past, and bringing forth a new dimension in the intent of those familiar lines...Standouts among the cast included Brandon Walker, as the titular prince and Erin Cronican as the doomed Ophelia. Mr. Walker’s portrayal of the titular Danish prince was dramatic and not melodramatic – his anger was understated, and his sorrow was understandable. Ms. Cronican’s portrayal of Ophelia was brilliant – her Ophelia was not an overly hysterical, lovesick girl whose passion for Hamlet was her only reason for living; her descent to madness was gradual and believable, and heartbreaking to witness. Also notable were Jason Wilson, Alan Altschuler and Janice Hall as Claudius, Polonius and Gertrude, respectively, all of whom portrayed their respective characters as three-dimensional people and not the stereotypical villain, the loquacious accomplice and doting mother (again respectively) – they all kept their emotions in check for much of the play, letting it fester and manifest itself at the right moment, so that their outbursts are unexpected and effective." Kelley Blessing, Patron Review: Time Out NY - "I have a Master's Degree in theatre and spent a great deal of time studying Shakespearean acting in graduate school. I have seen "Hamlet" numerous times and I must say this is the best staging of it I have ever seen. The acting was fantastic, the design work incredible and the directing spot on. It was clever, engrossing and it really drew you in. I highly recommend this production!" "Theatre Lover", Patron Review: Time Out NY - "This production of Tom Stoppard's absurdist play is riveting, compelling, and amusing, as it should be. The Seeing Place's bare-bones approach to this comedic, existential drama is spot-on and allows you to focus on the genius of the script and the superb acting. Though Robert King and Philip Lakin as Guildenstern and Rosencrantz, respectively, make their mark in Hamlet, they really get an opportunity to shine with this production. This show is a perfect complement to the dense classic that the ensemble is currently performing in repertory. Both shows require a massive amount of commitment and skill, which The Seeing Place tackles with aplomb. Run to see both now before it's too late!" Nance Schick, Patron Review: Time Out NY - "Like most people, I have seen a lot of Shakespeare and I've often had to fake my appreciation for it beyond the sets and costumes--until I began experiencing it at The Seeing Place. The acting is organic and the delivery of the stories is much more relatable than in most productions. This company makes difficult material enjoyable and touching. I don't think I've ever felt a tear roll down my face in HAMLET, until last night. For the first time, I really got his struggle without it being commanded loudly or with force. Brandon Walker gently brought me into Hamlet's crazy world. I was seduced by Jason Wilson's charismatic Claudius. I felt Gertrude's naivete and shame through Janice Hall, and I identified with Erin Cronican's Ophelia too much. I could go on. The entire cast was enjoyable and engaging, delivering far more than I expected. This company gets better all of the time. I am glad others are finally learning this, too! :)"
Margarette Connor, Patron Review: Time Out NY - "I went to both plays, and I'm very glad I did. Started with Hamlet, of course, and it was passionate, vibrant, well-paced and surprisingly touching. I cried at the end, and I never cry at the end of Hamlet. I think it was partly the acting and partly the intimacy of the theater. It's a small space, so the impact seemed greater. The set is sparse but beautifully done. All around I very much enjoyed the evening. The next day I saw Rosencrantz & Guilenstern are Dead. I'm not a huge fan of absurdist theater, but I wanted to see what they did with it. It was amazing. They brought it to life and made it seem like I was watching people, not stilted, dated "literature" being recited (which I have seen happen far too many times). I laughed out loud more than I ever have at this comedy. This was more impressive than the Hamlet only because I didn't expect to love it. And I did.Having the actors play the same characters in both plays brought a richness and depth to the R&G. And it highlighted the versatility of a very talented group of players. I'm very much looking forward to their next season. So, in a nutshell: go. You will very much enjoy it." "alan", Patron Review: Time Out NY - "If you like 'Hamlet' and you like 'Waiting for Godot', you'll love [R&G]." Jacqueline Parker, Patron Review: Time Out NY - "I was amazed at what a powerful production this was. It is done in modern dress, which I usually find offputting, but this company made everything work, on a very small stage. It certainly ranks as one of the most memorable Hamlet's I've seen. The staff is cordial and welcoming -- I'm returningg for R&G AreDead. Get thee to Hamlet!" Brian Charles Rooney, Patron Review: Time Out NY - "I attended the Tuesday, 6/25 performance of the company's production of "Hamlet." Again, I am impressed by The Seeing Place and their commitment to affordable theater, without compromising the quality. The play is well-cast, lead by Brandon Walker, an actor who has clearly done his homework without ripping off the performances of other great actors who've been fortunate enough to play Hamlet. The design and staging has been tailored to reflect a modern sensibility, and that works here for two reasons: Walker and the rest of the cast are capable of delivering the text with a modern feel without the text losing its integrity; and the designers have incorporated modern elements without beating the audience over the head with them. It's a simple and clever exection. Erin Cronican is outstanding as Ophelia. She delivers Shakespeare's text with a subtle longing, which evolves into a feverish madness, which will leave you open-mouthed in the second act. Janice Hall and Max Lorn-Krause also stand out with strong performances." 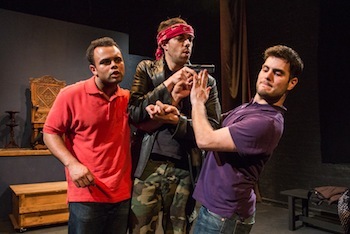 Eduardo, Patron Review: Time Out NY - "I was able to see Hamlet last weekend and R&G Are Dead today. I have never seen a stage production of Hamlet before and must say that although this production is not in the costumes I expected for the Shakespeare classic they pulled it off incredibly well. I was totally captured by the cast and left the theater feeling like I truly experienced the classic play. R&G Are Dead was also excellently performed. It was funny and entertaining. Again I left the theater feeling like I just experienced a great show. I highly recommend these shows." Both shows are in their final week, catch one or the other, both if you can, and help support the endeavors of this intrepid group." Corry Doyle, Patron Review: Time Out NY - "Hamlet's brilliance capped in madness is profound and watching things go awry as Hamlet schemes, particularly the unexpected effects his actions have on Ophelia is captivating. This Hamlet does not simply serve sympathy for Hamlet. You see Hamlet's actions impact the juxtaposed family very strongly. The cast builds as show that leads Laertes' anger, pain, and plans for revenge to be justified. This Hamlet is in modern dress and delivered in a relatable, approachable way. There is humor, the cast is very engaged in the world they have built. Thank you The Seeing Place Theatre for affordable accessible theatre." Robin Siegel, Patron Review: Time Out NY - "Just loved R & G!!!!!! Lakin and King were funny, real and honest. They made a difficult play understandable and relatable. They got it.....and so did we!!!!! For a fun night with talented actors go see R & G.
Robin Siegel (2nd Review), Patron Review: Time Out NY - "Having seen Hamlet last week I must say I was overjoyed and impressed with this wonderful production. The cast, beginning with the ever talented Brandon Walker, were tremendous. I have seen many productions of Hamlet and must honestly say this falls at the top of my list. This company deserves serious attention. Moving forward I hope to continue to see more excellent and realized plays from them. I also saw R & G for the second time on closing day. Tremendous!!! Lakin and King, as well as the entire cast, were simply amazing. What a talented group of actors Mr. Walker and Ms. Cronican have put together. Bravo to all!!!!!" John Ohlson, Patron Review: Time Out NY - "Wow. I loved Hamlet since high school but never thought I'd see such an engaging stage production as this. If my Mom came to town and I wanted to take her to a show, I'd take her to see this one. I was beyond impressed and can't wait to see Rosencrantz & Guildenstern next week! I'm sorry I can't give 6 stars." Paula Rossman, Patron Review: Time Out NY - "I absolutely loved this production of Hamlet - very real, visceral, focused. From the first scene I found it compelling and was drawn in. Kudos to the cast and company. I highly recommend this production! Thanks for a terrific evening of theater!!" Thomas Brophy, Patron Review: Time Out NY - "This isn't your father's Hamlet and certainly not Mel Gibson's. This is a Hamlet that frankly not many f us have seen. Because the good folks at The Seeing Place Theater have done their research about Shakespeare and they have given us a wonderful version. They have modernized it but themes remain true. They aren't a distraction, at least not for me. The acting is also top notch. I am an actor from Seattle and while in town I wanted to check out independent theater in NYC and I was surprised by the lack of these theater companies. They are very vital to the life blood of theater and I am grateful for The Seeing Place Theater who make theater not only enjoyable, thought provoking and visceral but also very affordable. I mean $12. How great is that. Show them some love and check out Hamlet or Rosenkrantz and Guildenstern Are Dead, as they are doing them i n tandem all with the same actors. That's a challenge and they are more than up to it." Elin, Patron Review: Time Out NY - "My family went to both plays and really loved them. I really thought Hamlet was extraordinary; every role seemed fully developed. The staging and direction were excellent and really make the play have a very human scale. R+G is obviously a very different play, and a totally different part of the cast takes the forefront. Both the title characters and the tragedians are well played and the direction takes advantage of the intimacy of the space and simple staging. The space is just one of those amazing NYC things, where who would have guessed that there would be a theatre on the 4th floor. It was so amazing to see this cast in such an intimate space. Not to mention to get to chat with them before and after the performance. $48*2 for a family of four tops this off as a great way to spend two evenings." Micky, Patron Review: Time Out NY - "Shakespeare-phobes, be NOT afraid! As a theatre actor myself, I shamefully admit that Shakespeare has never been of much interest to me and, to this day, feels like a foreign language. The best part of this production was the incredible work done with the speech by the actors. How many times have we heard the "to be or not to be" speech and REALLY understood what Hamlet was saying. Thanks to the remarkable talent of Mr. Brandon Walker and Ms. Erin Cronican (co-directors and the plays' Hamlet and Ophelia), we get to hear and understand every word and thought like never before. With a minimal set and very clever lighting choices, the productions being rhe stories of every character to life in a current and refreshing way. For $12, this is some of the best theatre you will encounter in New York City. Don't let the venue deceive you! As per the company's recommendation, i do strongly advise you see Hamlet before R+G as it will make a bit more sense." Thia Stephan, Patron Review: Time Out NY - "I was absolutely delighted by this Hamlet - though some actors "honor the verse" more than others, the varying approaches didn't bother me in the least, because the storytelling here is clear, and exciting, and fun. If you've never seen Hamlet this is an excellent place to begin, because you will be able to follow the plot very easily. . . and if you know the play extremely well you will be surprised and pleased by some of the choices. It's compelling theatre no matter what your background. I highly recommend it. Great job, Seeing Place!" Margarita, Patron Review: Time Out NY - "I absolutely loved both plays. Not only are the performers excellent, they also pull it off with a minimal set and simple costumes, which made it even better. I had never seen Hamlet on stage before and I must say I was very impressed, I thoroughly enjoyed it and I was very glad I finally got to see it. Rosencratz and Guildenstern are dead is a very funny play and it's especially interesting to see the same cast switching to comedic roles and to have the focus shifted to two actors that did not have very fleshed-out roles in Hamlet." Paul Hadsall, Patron Review: Time Out NY - "I thing we've all been exposed to Hamlet in a high school English class or perhaps through one of the Hollywood productions that have been made over the years, but seeing it acted out on stage brings the play to life in a way that nothing else can. The Seeing Place production is well-staged and well-acted, with Brandon Walker (Hamlet) and Erin Cronican (Ophelia) turning in particularly fine performances. At 3 hours and 15 minutes, Hamlet is not a short play, but you won't be tempted to glance at your watch during the show." 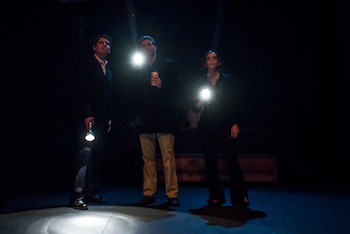 Kathleen Cushman, Patron Review: Time Out NY - "Saw R&G yesterday, great play, well acted, can't beat the price. Worth seeing before it closes--terrific idea to stagger it with Hamlet and the same cast!" Nancy Ludmerer, Patron Review: Time Out NY - "I enjoyed this production of Hamlet so much, I went to see it twice. Terrific insightful performance by the entire cast. Heard new meanings in words I've listened to many times before (this was probably my 20th Hamlet -- first was Richard Burton, when I was eleven). The second time I took two teens, who loved it too. Staging is simple but evocative; with a modern slant, for sure, but true to the meaning of the text, with some very interesting juxtapositions. Well worth seeing! The intimate space only enhances the experience." Noelle Tate, Patron Review: Time Out NY - "Wow. I am SO grateful that I got to see HAMLET on 6/27. It was just incredible. I have never seen Shakespeare this well-done. It was so natural, exciting, emotional, and I was in awe of the acting. The use of space and the set design was also wonderful and supported the story perfectly. It was creative and organic and I felt like I was watching the actors perform this for the first time although it was toward the end of their run. They were fully committed and I couldn't be more impressed with Brandon Walker as Hamlet. I truly cannot wait to see more of their work in the future. When you see theater done well with such commitment - it restores your faith in the arts and lifts your heart." Rose Lamoureux, Patron Review: Time Out NY - "Ok, here's the deal...I am not a fan of Shakespeare. Repeat...I'm not a fan. Much to my surprise, I became one on Saturday night. For the first time in more years than I can remember, I truly enjoyed watching a Shakespearean production. The Seeing Place's rendition of Hamlet was moving, truthful, powerful, and provoking. I am so in awe of what I had the honor to witness. This company and their pool of talent need to be recognized and respected. Rosencrantz and Guildenstern Are Dead was also top notch in every possible way. I was thrilled and uplifted coming out of the venue at the end of the day after enjoying such stellar performances. I can't wait to see more good stuff coming from these folks. Brava, bravo, and kudos to all who were involved!"